We believe that music can improve the quality of life of individuals and their families, which promotes a happier and healthier society. We will create musical programs that will enable a child to feel like an asset to their respective community. Playing a musical instrument has many benefits, but most importantly, it can bring joy to you and everyone around you. We hope to promote the presence of Brazilian heritage in a city that is known for its rich cultural diversity. 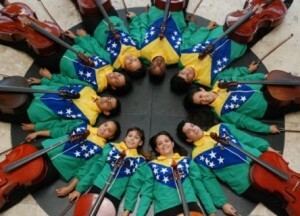 The mission of the Brazilian Music Foundation is to promote and advance Brazilian Music in America, to create resources through music concerts, educational programs, and donations, to support organizations that remove children from the streets and teach music thus creating an opportunity for a better life. Through our educational concerts the foundation will also be disseminating Brazilian music, along with strengthening the public awareness and appreciation for the country’s heritage. Foster creativity and break barriers of communication between the two countries. Advance Brazilian music through the cultivation of new works, artists, and audiences. Our goal is to create fun, unique opportunities for children and young adults to learn about Brazilian music and culture and at the same time gather financial stability to provide funds to higher musical education to talented kids that lives on the streets in Rio de Janeiro and many other cities in Brazil.